What can printed hardback books do for me? There is nothing as exciting as seeing your work in print for the very first time, why not spend a little more and have some or all of your books with hard covers. Azimuth Print offers top quality cheap book printing services for authors and publishers looking to produce beautiful, yet affordable hardback books. Hardback books will give your project a very high-quality, professional look and feel. Aspiring authors can also make use of our books to produce the first run of their latest novel to send to publishers in a hope of becoming a published author. Our hardback books give a coffe table style book finish so as to impress friends and family. 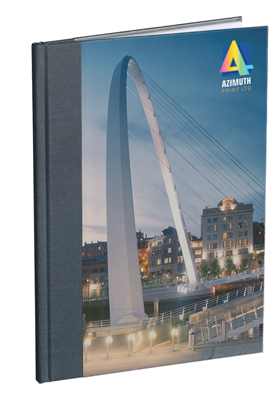 Azimuth Print, the UK's premier hardback book printer offers a fast, high-quality hardback book printing service. Our hardback books come in three sizes, all have gloss lamination to the cover and the text pages are on a high quality paper. We offer three sizes, A6, A5, and A4 in portrait and landscape (excluding A4). Other bespoke sizes can also be produced. Hardback hardcover, or hardbound is a book with rigid, stiff protective covers. Our hardcover books have glued spine, just like our perfect bound books. They are printed on 100gsm Multicopy, and are much more durable than perfect bound books. Our hardcover books are priced to be attractive to writers and publishers who wish to show their work in the best possible format. You can even order only one book if you would like to see your hard work put into print! Read our article about print on demand and self publishing: Self Publishing a book is easy! You can either send us your own artwork or commission our designers to come up with a great look for your printed books for an extra charge. If you need to make small changes to your copy and design, we can take care of these at no extra cost, while larger amendments to your hardback book can also be made for a fee. To find out more about the UK's premier hardback book printer, just get in touch for a quote or for answers to any questions you might have about our hardcover book printing services.